When I began practicing yoga nearly three years ago, the effects it had on my vocal technique were almost immediate, from discovering more space for effective breath support to finding efficient vocal placement, greater vocal freedom, and the ability to calm and quiet my mind prior to auditions, performances, competitions, and musical preparation. Fascinated, I quickly began to explore the correlation between my yoga practice and my vocal performance. And as it turns out, I’m hardly alone as singers from classical to pop and rock are also realizing personal correlations between the two. Here we’ll explore the benefits that certain yoga poses can have in helping singers discover greater access to their instruments by focusing on the core as well as the pelvic floor. Yoga came somewhat naturally to Lister, who began her artistic journey in musical theatre as a dancer before moving into opera as a singer, composer, director, and associate professor of music at the University of Nevada–Las Vegas. Her most recent work recently debuted. State of Grace is a one-act opera about a yoga teacher named Grace who, after a breast cancer diagnosis, finds new meaning in the yoga principals she has taught for years. Lister has also led sessions on yoga for singers at universities across the country, as well as at Emerald City Opera, Druid City Opera Workshop, Taos Opera Institute, and Karmany Yoga. Additionally, she has presented at national conventions of the College Music Society, the International Congress of Voice Teachers, and the National Association of Teachers of Singing. Lister recommends yoga poses found in the warrior series as well as triangle, upward-facing dog, chair, and camel poses. Tadasana, or mountain pose—the foundation for all standing yoga poses—is also beneficial. Warrior I and II: Strengthens the legs, opens the hips and chest, stretches the arms and legs, and emphasizes balance and grounding. Reverse warrior: Stretches the sides of the torso and arms, opens the hips, and builds lower body strength. Triangle: Engages the whole body, strengthens the core, opens the hips and shoulders, and stretches the legs. Upward-facing dog: Opens the chest, aligns the spine, and strengthens the whole body. Chair: Strengthens the lower body and stretches the upper back. Camel: “Opens” the heart and expands the chest. Tadasana: Improves posture, grounding, and stability and encourages confidence. 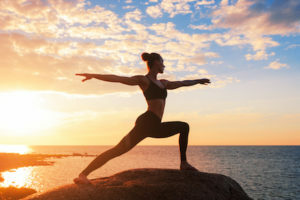 Lister says that two of her favorite poses include tree and eagle—both of which can be practiced on one leg (in tree with the foot pressed into the inner calf or thigh, and in eagle with the legs wrapped) or by using the alternate leg as a “kick stand.” Both are great for beginning yogis, but even those more experienced can continue to reap their benefits. Tree: Increases balance, focus, memory, and concentration and strengthens the knees and ankles. Eagle: Strengthens arms, legs, knees, and ankles; opens hips and IT band; and improves balance and focus. Aside from keeping the core engaged in singing and in practicing yoga, there are a variety of poses that help build engagement. Boat: Strengthens abdominal muscles, improves balance, and strengthens the spine and hip flexors. Cat: Improves posture and balance, strengthens the neck and spine, and stretches the hips and abdomen. Dolphin: Stretches the hamstrings, calves, and arches and strengthens the upper body, shoulders, and legs. Dolphin plank: Strengthens the upper body, legs, core, and spine. Also improves posture and stretches the shoulders, hamstrings, calves, and feet. Plank: Strengthens the upper body and shoulders as well as the muscles in the spine that aid posture. Side plank: Stretches the side body and the intercostal muscles and strengthens shoulders. Chaturanga Dandasana: Emphasizes alignment while building strength throughout the body. Happy Baby: Releases the lower back; opens the hips, thighs, and groin; stretches the hamstrings and spine; and can relieve stress and fatigue. What Is the Pelvic Floor and How Does It Pertain to Vocalizing? Low lunge: Releases tension in the hips and stretches the hamstrings, quads, and groin. High lunge: Opens the hips as well as the chest. Also stretches the groin, legs, and spine and strengthens the lower body. Megan Gloss is a classical singer and journalist based in the Midwest.